“We received training on planting drought resistant maize varieties, line spacing, fertilizer application and use of tied-ridges to conserve soil water. I implemented all the best practices we were trained on and I am grateful it has paid off in such a big way!” she says with a bright smile. 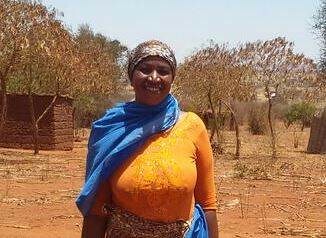 “My fellow farmers wondered if I used “uchawi” (magic) in my farm since it remained green while others were drying,” she adds. 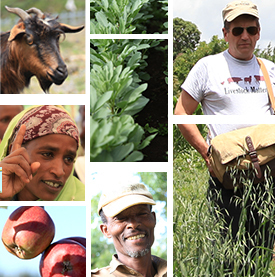 Mashehe asserts that, “the higher yields from my farm were largely due to use of tied-ridges that held the little available rain water for longer period”. This meant that soils were wetter for longer periods compared to neighboring farms that used flat planting. “This time the yields are more than enough to feed my family! I intend to apply the postharvest best practices were trained on to store them and sell at the right price in order to generate school fees for my children,” she explains. The Africa RISING-NAFAKA-TUBORESHE CHAKULA scaling project is working to introduce farmers in Kongwa and Kiteto districts in Tanzania to simple seasonal in-situ water-harvesting innovations such as tied ridges, planting pits and trash lines, combined with contour planting to reduce the consequences of both heavy rainfall and short-term drought. The on-going work also integrates other aspects like nutrient management and improved maize seed varieties that are sensitive to low soil moisture. It is anticipated that this work will ensure 47,000 farmers can be able to adopt these practices through this initiative. Tags: nafaka, Scaling, Tanzania. Bookmark the permalink. This is great but the photo gives a different story. 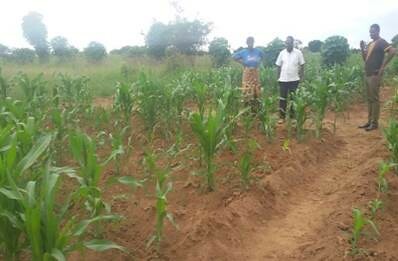 As an Agronomist it is difficult to understand how with the low plant population in this photo, the farmer got so much maize. The article does not indicate the “total Area” from which the 60 bags was harvested – is it the 4 acres? It is always good to indicate the weight of the bag – is it 90 or 50 kilos? That would help put the “whopping 60 bags” into context. This is a dry area and any technology that produces such high Maize yields should be scaled up. Dear Jonathan, in Dodoma Region and Tanzania at large I bag = 100 kg (+); implying that Mashee farmers at Ngipa village produced 15 bags/acre (1500 kg/acre) . Usually maize grain yield under farmers field conditions varies between 2 and 8 bags/acre with an average of 5 bags to 6 bags (500 to 600 kg/acre)/ acre. The maize grain yield will be determined by choice of variety for instance hybrid maize usually result in high yields compared to OPV however it has be supported with Good Agronomic Practices (GAP) including optimal plant population; use of fertilizer, timely weeding and being semi-arid areas use of efficient soil moisture conservation techniques( IRWH) is of paramount importance. In view of information reported so far combination of aforesaid could reflect yield obtained under severe drought conditions during 2014/2015 cropping season whereby majority of farmers had complete crop failure in the same village i.e Ngipa. How can I get this specie of maize in Nigeria? My email is ejykphilips@gmail.com. Hello Philip, the process to have the hybrid move to Nigeria will involve testing it there (in Nigeria) and then it has to go through the variety release process which would require some seasons of testing in multi-location trials/ national performance trials. Please note that the number of seasons for the trials will depend upon Nigeria’s variety release procedure.